Janet Houdieno was not successful in escaping last night. Allan’s nickname for her is starting to stick. Nurse Arlene has returned from vacation and was shocked and amazed that Janet got out of bed the other day. She’s not caring for Janet today but stopped by to chat. Quality. I got Janet stretched out and ready for Physio after Daniel and Pam cleaned her up and dressed her. The nurses seem to like putting clothes on Janet for the day. Kind of like dressing a doll it seems. Sean gave Janet a good stretching workout this morning. Not as intense as yesterday but really focused and trying to get responses from Janet. She did track him with her eyes a number of times on command. First time! She has followed people walking by etc but never back and forth deliberately like this. Really glad she did it for a pro like Sean and not just me alone. Hopefully that news gets reported up the chain. Sean also noted better movement in Janet’s hips and pelvis today. He does recommend Botox as a way of preventing Janet from curling up into a little ball. I will discuss that with the rehab Dr when he comes by. Waiting for bath time and thanking God for all He has blessed us with. Larry…I have known botox to work well for muscle tension. A command performance for Janet today! After tracking Sean this morning she obeyed me (first time ever) over and over again when I asked her to sit up straight, look up and most fun of all, take your hat off and give it to me. Instantly up went the arm, off came the hat and she held it out for me to take. I may start recording this stuff on video in case I have to argue my case to any unbelievers. Janet slept after her bath so I headed home for a break. She was awake when I got back having story time with Janet F. and doing a little Houdieno action. We got her into her wheelchair with the new lumbar support and Brenda arrived to read with her. Of course she promptly fell asleep so the chair must be comfy. As Brenda and I chatted Carrie, Brea and Elysa walked into the room. What a great surprise! Janet unfortunately slept for about a half hour but woke up just as Sandrine walked in. Janet never knew she is so popular. The Snowbirds were performing by this time so off to the beach we went. Not sure if Janet clued into the jets overhead but she seemed very happy to be outside. Back in her room an hour later it was dinner time and she stayed awake right through listening to music and me. She nodded off at 7:45 and I left her with the night crew to put her in her new lower bed and PJ top to sleep in instead of those silly gowns. Very happy day. Praying for more “obedience”. Hard work for Houdieno already this morning. Janet was all snug in her new bed when I arrived. Her nurses came in right away to wash her and get her dressed. That got her eyes open then Connie from Speech stopped by to ask how Janet was doing. I informed her of the response to some commands and her successful escape attempt. Connie thought that was great. She gave me some more ideas for getting Janet to communicate like holding two opposite objects apart and in front of her and asking her to look at a particular one. Asking her to turn on light switches or some gadget where there is an immediate response like noise or light. If any of you have suggestions please fire away. Dr. McCann came in shortly after that to talk Botox. Sean appeared a couple minutes later which was great because he could better explain where the treatment is needed. I agreed to go ahead with the treatment as Physio and the Team don’t seem to be gaining ground on Janet’s flexibility. If anything she is tightening up in some areas so we need to do something. They will inject in three areas next week and the effect lasts three to four months. During that time it is hoped that Janet will gain spontaneous movement and the effects of Physio therapy will be enhanced. With Sean in the room I asked Dr. McCann if he had spoken with Tom last week re Long Term Care, he said no. I explained what Monika had told me and expressed my unwillingness to see Janet go to LTC if she is making progress here. I outlined all the changes Janet has had since Sunday and my thought that Physio therapy is the key treatment for her and that would be severely diminished in LTC. He totally agrees and I asked him to talk to Monika. Here’s hoping. Sean and Leanne did some experimental stuff with Janet today. Sitting her on the edge of the low bed and ” standing up”. Janet is not able to take all her weight or stand straight but it was pretty cool to see her putting some of her own weight on her legs. It was a little too early for Janet to fully engage in her workout but what she did was great and she is showing signs of improvement. Sean gave me a few more exercises to do with Janet while in the wheelchair. All that in the first ninety minutes of the day. I need a rest now never mind Janet. Thanking God for His blessings and for Janet’s progress. Larry these are amazing updates. I truly believe that you being there for Janet and the staff and being the director of communications has enhanced the care Janet is receiving by a thousandfold. Praying for continued progress, more ‘obedience’ and joy every step of the way. What a beautiful Okanagan evening! Thanks Janet for letting me enjoy it. I was home tonight at 7:20 and got to take Nash for a walk. Janet stayed in her wheelchair from about 9:30 this morning till 4:15 this afternoon. That included sleeping till 11:20 when I left, sleeping while Sandi visited for forty five minutes and being wide awake when I returned at 2:30. She was doing some Houdieno action but seemed comfortable. We went for a walk to the beach which was much quieter today. Janet “watched” people playing in an inflatable boat in front of us, noticed kids running on the beach and spotted a beach ball rolling on the sand. She took her sunglasses off and didn’t want them back on again so I put her other glasses on and she liked that for a while then she switched back again. Whatever. While sitting on Pandosy St. she tracked people as they walked by especially a dad and his two year old daughter. The kid was riding on his shoulders and Janet tracked them from left to right and stayed locked on for a good ten seconds to the right. I watched her the whole time but when I noticed her watching that long I turned to see what she was looking at. By this time the dad and daughter were twenty yards away but the little girl was turned around looking at Janet. It was so sweet I almost cried. Janet has always been a kid magnet and she clearly still has that power. Back in bed I stretched Janet out. It took twenty minutes but I got her legs into a pretty good position. I read some of a book called Rebooting My Brain to her. Mary Gaga ordered it for us. It’s the story of an aneurysm survivor and so far it is a very familiar story. Thanks Mary Gaga. Dinner was finished by 6:30 and the nurses changed Janet and put her in her PJ’s. Janet closed her eyes for a bit so I took that as my cue to exit. Of course as soon as I changed she was eyes open again but I decided to bail anyways. As it turns out Kiko managed to tear herself away from Walmart to visit Janet shortly after I left so Janet was not alone long. Just had a good chat with Cathryn, the brain lady. She noticed a change in Janet tonight since the last time she saw her two weeks ago and I told her all the stories of this past week. I explained my concern over moving Janet to LTC and she understands and will talk with Monika on Tuesday. Nice to have someone else on the team. Thanking God for the glorious and productive day. Thanking Sandi for the amazing cookies. Janet is coming along more and more every day. She is so fortunate to have you Larry. Keep up the good work. I look forward to your reports daily. Take care Larry and we will pray for more accomplishments tomorrow. Houdieno was at it again this morning. Head resting on top of the bed rail and pillows askew as she tried to clear a path for herself. With Janet moving around this much now there is not much the nurses can do for positioning because Janet will just move out of it when she wants to. Sean came by and I helped him stretch her and “stand” her up. He felt she was not as tight this morning and her legs were not shuddering as much either. Janet wiggled her toes on command a couple times and held her left arm in the air on command. There was lots of reacting to sound and she sat up and looked up on command. Sitting on the edge of the bed, Sean let Janet fall to her left and she stuck her left arm out to break her fall. That got Sean really excited. He says that shows good communication between brain and muscles etc. There is still no response doing the same maneuver to the right. As for standing, Janet was able to have both feet flat on the floor, her upper body leaning forward into Sean and me lifting her from the hips so that her weight went onto her legs. It was just for a few seconds at a time but really good for her. Janet is resting in her wheelchair now and I’m going to cut her toenails while she’s not looking. Awesome – way to go Janet and Larry!!! Well done SBM… you can hopefully show me your new tricks on Tuesday for an hour! Janet snoozed her way through my attempt at cutting her toenails and I took off after that to cut something I’m much better at, the grass. Janet was back in bed and hanging out with Twyla when I returned. After their visit it was time for some Okanagan sunshine. Sean moved Janet into her wheelchair this morning all by himself so I decided to give it a go. I had nurse Meaghan stand by just in case. Didn’t need her though, Janet is very easy to move and she even held my shoulder for the short ride from bed to chair. We kind of broke a rule on our walk today. We got back after an hour and out of curiosity I asked the nurses how far away I am allowed to take Janet. Apparently not off the property. We walked about six blocks north on Abbott St. Oh well, Janet enjoyed it and that’s all that matters. Dinner was next and I read more of Rebooting My Brain. Eerily similar experience to ours. Hard to read sometimes but I think it’s important and Janet is relatively still when I’m reading it. Another first today for Janet too. I asked her to lick her lips as she had a little goo resting there. She did it! Praying for healing in Janet’s legs and her ability to communicate. I arrived this morning to Janet in her wheelchair already and not looking that happy about it. Maybe because she was still in her PJ top, no pants, no socks and only one booty. Not cool. I took her splint off and worked her right arm a little. Tried the legs but too tough while in the chair so I checked with her nurse, a guy she’s never had before, and told him I was putting her back to bed to stretch her out. I got her dressed then the workout began. She was really tight to begin with but loosened up pretty well. The left leg goes pretty straight but springs back to bent really fast. The right leg is pretty relaxed. I sat Janet up on the side of the bed with her feet on the floor. With a little pressure on the knees I can get her feet flat on the floor. She fell asleep before we could do anything else so I think I’ll sneak her mouth medicine into her then head home and come back this afternoon. Praying for an active afternoon and evening. My average speed riding my bike to KGH is 26 km/hr. When Usain Bolt set the WR in the 100m he ran at an average speed of 43.5 km/hr. Holy crap! Not a gold medal day for nurses. Came back to find Janet in her chair as instructed but still plugged into the feed pump despite lunch having ended an hour before. Not a big deal but. I got Janet ready and we went out for a walk. Must have been too warm for her as she was asleep when we got to the beach. She woke up a little later and we sat in the shade on Pandosy St. for a while. Back inside Laura stopped by for a visit. She read the letter her mom Nancy had sent that I couldn’t get through. Thanks Laura! Earlier today Claudette sent me a link to an article on music therapy. Apparently it was a key treatment in the recovery of US Congresswoman Gabby Giffords. I had been wanting to read Janet a book on Gabby Giffords and am intrigued by how music helped her. I feel this is an answer to my prayer the other day for help with Janet’s communication. I downloaded a music therapy app and used it with Janet this afternoon. It shows a close up of either a male or female mouth slowly singing songs like Happy Birthday or Twinkle Twinkle Little Star. I have shown Janet many things on her iPad before but during music therapy she reached out and took the iPad from me and stared into it like she wanted a closer look or to pay closer attention. It wasn’t let me see what you are holding it was let me see and listen closer. Impressive. Kiko has already offered to research this more as Janet has responded strongly to her singing as well. I think we are on to something here. Another first today was Janet reaching across her body to grab her right hand and caress it, look at it and even straighten out her fingers. I asked the Hospitalist if he thought it was a pain response or becoming more aware. He was pleased to hear it and thinks Janet is becoming more aware. Reaching across her midline is a good sign. Being aware of that hand and arm is good as well. He remains reluctant to predict any future outcome. I took a break to go to church tonight. Glad I got to hear Allison lead Revelation Song and I got to enjoy a lemonade with Candice. When I got back, Janet was slumped forward in her chair sleeping and again not unplugged from the feed pump. She had thrown her pajmina on the floor and was all goosebumpy. No medals for nurses today. Kit is with her tonight so all is well. Praying for an epic Sunday. Larry, this is amazing ( well….not the the feeding tube part) and I have to say Janet is the luckiest person to have you! Stay strong! The Olympic fails continue. Arrived this morning to find Janet curled up in bed, plugged in and needing to be changed. She was also in a hospital gown, not the PJ top I left her in last night and it is no where to be found. I guess it’s possible Kit took it home to wash it so let’s stay positive and go with that for now. I asked the male nurse to unplug her and change her and when I came back her dirty pad was on the floor under the bed. Gross. I also noticed her splint was on incorrectly, probably from changing her overnight. I took a picture in case I have to really complain about the quality of care. Thank God for student nurses. Daniel is on today as well and she is very good with Janet. I don’t think that guy means to do a lousy job he just isn’t a details guy. Janet stretched out really well this morning except her left leg is a little tighter. She is resting as I type this but woke up briefly, looked at me and held out her hand. I grabbed it and it was clear all she wanted was help to sit up but I’ll take that. Cool she knew I was there and very cool that she knew to reach out her hand for help. It may not be an epic day yet but it had been an interesting start. Praying for flexible legs and heightened awareness. An epic day but not in the way Janet would like. Her dietician changed her formula a few days ago and it is going right through her and today through the clothes she was wearing as well. Epic. I share this only because Daniel and guy nurse stepped up to get her cleaned up. I know it’s their job but sheesh that deserves praise. Bronze medal for Daniel. Guy nurse deserves to be on the team. Too hot for Janet at the beach today ( never thought I’d say that ) she was sweaty after five minutes so to the shade we went. She was very aware, watching lots of cars go by and people and really tracking them well. Courtney and Mike visited this afternoon and just before their arrival Houdieno figured out how to undo her seatbelt. I told the nurses and they will chart it and think OT will place a buckle over the button so she can’t do it again. Stretching was fine everywhere except the left leg. Finally got it relatively straight tonight then it just kinda popped back up again. She was moving it pretty well as I left her tonight trying to get out of bed. Kiko visited later and reports they had a good musical session and Janet even made a sound. Had her mouth shaped like an O and “said” something? I’ve been trying to get Janet to learn some signals for yes and no. So far thumbs up or down seems the most possible. Janet paid attention to the musical therapy app again today and I had her tap the iPad using an app where you tap the picture and a voice tells you what it is. Not sure if she was totally engaged but she didn’t mind me helping her tap. We also called Mary Gaga so Janet could hear her moms voice and Mrs. Korotana sent an email and photo describing a hike her and Raj did. Janet paid attention while I read and she looked at the picture. Praying for a restful and solid night and active and solid Monday. Physio therapy is hard work. Janet is snoring away after her workout and I feel like I could do the same. After Jennifer and I cleaned her up ( I must be real close to my LPN certification by now) I went to work on her legs. Her hips and pelvis seem looser today but both legs are tighter at the knee for sure. It will be good to see Sean tomorrow. I had Janet sitting on the side of the bed with feet flat on the floor for a good ten minutes. She (or her tight muscles) held herself up really well and when she did start to fall back or lean over she corrected herself on command. Sitting up seems to take a lot out of her or maybe it’s the time of day. I will try again this afternoon and hopefully do more self correcting exercises. This week’s Hospitalist is Dr. Sharko who we had over on 4 West. I told her all about the improvements Janet has made and also how the new formula is just going right through her. We can’t change the formula without approval from the dietician so the amount Janet gets will be reduced today and hopefully get a better formula tomorrow. Good start to the day, good crew of nurses on duty. Thankful for that. When I returned in the afternoon Janet was back in bed. She had been awake through lunch but the nurses thought she looked uncomfortable so they changed her and put her to bed. Quality. That gave me a chance to stretch her out some more then sit her on the edge of the bed. This time she was really into it, keeping her head up and feet flat on the floor ( with help ). I could hold both her hands out and “dance” with her and also do some jumping jacks (without the jumping). The best moment came when I asked her for a hug. She leaned forward as I leaned towards her and she put her left arm around my shoulder and patted my back. As I moved back out and talked to her she caressed my right arm for a good thirty seconds. I want to say all this was very intentional but I will hold off until I get repeats. Same goes for this part. Janet smiled twice in the space of five minutes. I won’t share what I think caused the first one but the second I am going to credit to a big, noisy, whiskery kiss I gave her on the cheek. She gave one of those little baby laughing kinda smiles. Made my day. We went for our customary walk to the beach. Really windy but nice and warm. Janet seemed to enjoy all the noise. Back in the room it was time for some Garage Band. I tried all the instruments with her and surprisingly she liked the strings the best. She loved sliding her figure up and down to make sound as opposed to tapping but she did tap on her own with the keyboard for a few seconds. Not an overly enthusiastic response but a good start. Praying for a productive and healing day tomorrow and for a decision to hold the Long Term Care process while Janet continues to make progress. Seems to be hurry ip and wait day. Janet was awake when I got here, all cleaned up and just getting her meds. She was curled up pretty tight on the left side of the bed and I was worried how tight her legs would be. I actually got them stretched out reasonably well. The left one has far less range than the right and she seems to feel more pain when I move them now. Sean stopped by briefly to say he is waiting for Dr. McCann and wants to be here for the Botox injections. I asked him about the left leg and he is confident it’s all muscle tension not bone related. Before sitting Janet up on the side of the bed I asked her for a hug. Right away her arm went around my neck and she patted my right shoulder a few times. I’m calling that a real hug! Sat her up on the side of the bed again with feet flat on the floor. She did well correcting herself and her jumping jacks were pretty good too. After getting into the wheelchair we walked down to the laundry department in search of her PJ top. The lady I spoke to about it yesterday walked in seconds after us and announced she had found it! She brought it out all clean and folded. Janet placed it on the arm rest of her wheelchair with her arm on top and away we went. I’m taking that top home for safe keeping and will buy Janet some cheapo ones from Stupidstore soon. We are still waiting for Dr. McCann to appear. Janet is “reading” The Halloweiner. She has not slept much this morning. Just in short five and ten minute bursts. I hope that’s a signal of heightened awareness. That is indeed a real hug…and thrilling that she gave it to you. OOHHH Love the hug! More steps toward healing- Yey God, yey Janet, yey Larry!!! Janet loves you Larry. She’s strategic. Actions to show that first – words will come. You’ll see Janet then. I’ll c u in an hour. Great visit Janet and Larry…thank you! There are sparks which means there’s fire…SBM is moving…just not at a level we all see yet. I can see huge progress in the last 2.5 weeks, but even in the 90 min that I was with her today there seemed to be recognition and even a smile or two – dare I say some emotion upon my departure?…though most women are subliminally crying (my humor and presence) then smile when I leave! SBM even gave me a couple extra “monkeys” to keep the game going…she will win every time! Shout out to Larry….thank you! You are the best and I / we who also love Janet thank you! I am sad to leave but cannot wait to come back soon. Be strong SBM and feel the love! Since I am so far along in my LPN training I may as well go for designation as a physical therapist while I’m at it. We never saw Sean again all day nor Dr. McCann. Not a huge surprise coming out of a long weekend but I get mad when people say they are going to do something then don’t. Dr. McCann never said Tuesday for sure but Sean did and he delayed seeing Janet based on that. That is a full point deduction Sean. Good thing he taught me a lot and I was able to work Janet out a few times today and by “bedtime” her right leg was fully flat out on the bed with the left one as flat as I’ve gotten it since last week. I think sitting Janet up on the side of the bed is really helping. She seems to enjoy it and is loosening up a little. Her right hand is even less swollen now. The dietician came by when we were rescuing the PJ top and said to continue with the reduced quantity of formula and the nurses will give Janet a flush of protein twice a day in addition. So far Janet has responded well. As I was waiting for Dr. McCann to arrive the only break I took was to ride downtown to find out why Janet’s EI stopped after seven weeks when she is entitled to fifteen. Turns out I need to submit yet another Dr.s note saying Janet is unable to work as one other note they have on file says her return to work is ” unknown “. It should have said ” indefinite “. Now you all know. In fairness, Barb at the Service Canada office has been awesome everytime I’ve needed help. Uncle Monkey came to visit this afternoon and got a smile from Janet that even showed some teeth. Mike is a pretty funny guy. He got to witness Janet putting her hat on but in typical eastern fashion he was always in too big a hurry to let Janet try and push the elevator button. We did get him to stand still at the beach for fifteen minutes though. I think he was stunned to be at a beach where people actually go into the water. Janet clearly enjoyed having her brother around as evidenced by the emotional goodbye. Thanks Mike! After reading a little and stretching a lot it was getting dark and time for me to leave. Janet was in full Houdieno mode and I warned the night crew about her. Picture attached. Sorry email folks. No pic for you. Join Facebook so you don’t miss out in the future. The attached photo is for this message board only as it is posted without Houdieno’s consent. Praying for lots of positive attention from the medical team tomorrow. Off to a good start. Janet was getting cleaned and medicated as I arrived and Sean was waiting to get to work on her. He stretched things out real well and even found some muscles to work that I didn’t even know existed. We sat Janet on the side of the bed for a good twenty five minutes while Sean worked on her back and shoulders and hips. He even had her “dancing” to Lady Gaga for a bit. Dr. McCann is expected this afternoon and I am supposed to stretch Janet out after the Botox is injected. Dr. Sharko filled out more paperwork for Janet’s EI claim for me this morning so I am off to deliver that soon. Thanking God for all the time I get to spend with Janet and the good team caring for her today. I have to start by again praising Barb at Service Canada. I rode down there just before noon and as I walked in she was walking to the front desk. Her partner, Katie, who processes forms etc was there as well. They took the form I had Dr. Sharko fill out and told me I could fill out Janet’s reports tomorrow and she’ll get another eight weeks of EI. I was out of there in less than two minutes. Gold medal! I’ll give Janet a silver medal today. A good effort but she is capable of more. In her defense that formula still isn’t agreeing with her despite the fibre boost (not protein as previously reported). The dietician is due tomorrow afternoon and I hope to chat with her. Janet and I walked to the beach this morning while it was still relatively cool. She kept taking her sunglasses off and on and staring at them a lot. She was not at her brightest but still good to have her out. I got back from lunch just before two and started stretching Janet out in preparation for Botox. She continues to do really well sitting up on the edge of the bed, lasting a solid thirty minutes this time. Spent a lot of that time with her feet flat on the ground and also did some “standing” which I thought she handled really well. This is developing into the key treatment of the day for sure. Her legs were as limber today as they were yesterday but Janet seemed a little less comfortable with the movement. Could be she was a little on the tired side today although she did not sleep until four or so. Dr. McCann showed up at 4:30 to shoot some Botox into Janet’s legs. 150 ml in each abductor and 100 ml in the left hamstring. Should start to kick in about seven to ten days from now. I gave her a good stretch right after that as instructed so there would be good uptake of the Botox. Here’s hoping. Janet was awake and much calmer than last night when I left. Praying for a restful and healing night. Physio just keeps getting more and more interesting. Janet was awake when I arrived and her nurses got her all cleaned up and dressed. I started stretching her out then Sean arrived. We discussed the Botox treatment some more and how it will turn off three of the muscles that Janet has on 24/7. He found her left hamstring really tight this morning so decided to try something different. For the first time since even before May 15th Janet got to lie on her tummy! We rolled her over together and put pillows under her chest. I stayed close to her head and made sure she wasn’t getting too stressed. She didn’t like it at all at first with a few audible cries and whimpers. Nice to hear her voice. After a couple minutes Janet relaxed quite well and Sean was able to work his magic. It was amazing to see how easily Janet’s left leg relaxed and Sean was able to manipulate it like never before. Her right leg relaxed pretty much on its own. It was a pretty strenuous workout but highly effective. Sean’s therapy is geared towards breaking patterns. Getting Janet’s muscles and joints to do things they have not done for a while in hopes that builds new pathways in her brain. I love his approach and how he is willing to experiment and test Janet’s endurance. Janet is zonked out right now so I will leave her for a bit and see her after lunch. Praying for new pathways, communication and mobility. I think Janet gets a gold medal today. Not just for the workout this morning but for the smile she brought to my face when I got back this afternoon. Brenda was visiting and had been reading to her. As I came to the door the first thing I saw was Janet sitting all proper in her wheelchair reading a book. She was turning pages, not flipping but turning. Really looking at each page and being very serious about it. She had the book for a while so Brenda switched it off for another one. She looked at the front then the back then tried to discard it onto the bed. She missed but it was a strong and deliberate attempt. I gave her the book she had before and she started reading again. OT tweaked her chair a little and gave Janet a pillow to rest her arms on. I went out to get some water and came back to find Janet auditioning for a job in the laundry department. She had the pillow standing on end and with her left hand was pulling the pillow case off. She got it one third of the way before she dropped the pillow. I gave it back to her and instead of continuing trying to remove the pillow case she carefully put it back on all neat and tidy. I’ve noticed a bit of an obsession with tidy laundry. Janet often will straighten sheets and blankets while sitting in her chair. She always has been fussy about that sort of stuff. We went for our walk to the beach and Janet remained very alert and was taking her sunglasses off and on repeatedly. We walked past an 8000 sq. ft. waterfront home for sale and Janet nodded her head that she would buy it for us when she gets better. Back in the room it was time for school. I tried her on a few preschool apps on her iPad. The game type things are too advanced for her right now but one app has a tap along to the Alphabet Song screen. I think this will get Janet to learn to tap the screen to get responses. I helped her of course but after about twenty times she was sticking her finger out and requiring very little touch from me to tap. She did tap a few times herself but not to the song. Wendy visited late in the afternoon and Janet really perked up when she heard Wendy’s voice. Further evidence that your visits are having an impact y’all. Praying for heightened awareness and communication. What a productive day Janet and Larry!!! Whoo hoo! Sean’s last day with Janet and he made sure she will remember him. Janet was awake when I arrived and through our warm ups for Sean. He arrived, and after a few stretches decided to try something new since she was so alert. We sat her on the side of the bed and brought the table over to her. School was in session. Sean got a piece of paper and a pen and gave the pen to Janet. She seemed to know what it was and made a slight attempt to use it but started nodding off. An interesting experiment that I will try in the afternoon when Janet is more awake. Sean gave her some serious back stretches and hamstring work then we put Janet on her tummy again. Her right leg relaxes immediately and the left one stretches out real nice with some help. Janet tolerated being on her tummy really well. Sean worked with for half an hour then she slept for another half hour with me watching her. As she started to wake her left leg popped right up like it was spring loaded. Sean expected that and is hoping the Botox will prevent that when it kicks in. Janet tried a couple times to roll over herself then I helped her (I need a little more training on this move still). Changed and in the wheelchair she is snoozing away. Monika told me Janet has been assessed and approved for residential care but there is a lot of others trying to get in as well so it will be a long wait. Not sure how I can fight this anymore as it seems Dr. McCann did not speak to her nor has Cathryn. I’ll try them once more but I guess it really is up to Janet to make enough progress to get to rehab herself. The signs we are seeing lately are all good but not significant enough to change anyone’s mind yet. Update on LTC wait list. Janet was approved for residential care August 8th. If no bed opens up by Sept 8th the hospital will start charging us $30.65 a day to stay there. Cheaper than LTC and probably better care so I’m hoping there is no bed. I’m getting pressured by Monika to get signing authority over Janet. The only option available to me costs huge money and takes two months to get through court. Monika says she has gotten an exemption that allows me to sign the initial paper work but I may have trouble once Janet is at a facility. This whole thing is ridiculous to me and my lawyer still sees no urgent need to do this. I will talk to a care facility next week to hear their take on all this. Advice to you married folks. If you don’t have Power of Attorney over each other now, GET IT. It is cheap and simple while you are both able to sign. Once one of you can’t it becomes a NIGHTMARE. Janet is still not right with her formula. The dietician switched back to the one that was working before so hopefully she will adjust. Apparently the change was made because Janet’s potassium was getting too high. The dietician’s goal is nutrition not weight gain as long as Janet is not losing weight. Janet only had a short nap this afternoon and that was while Wayne was visiting but he does have that effect on people. Kidding. Our walk outside was a long one today with Janet being very aware the entire time. She also responded well to the music therapy app, not singing but watching intently. Her first for the day was reaching behind her back. Leaning forward in her chair (doing a monkey) she reached back with her left arm and rubbed her lower back. Clearly something was bugging her but all signs are good back there. All previous redness has diminished but I will mention this to Tom and OT on Monday. Great day so far for Janet. She was bright when I arrived and really looking at me. I leaned in close to give a run down of what I did last night and she started rubbing my shoulder. Our workout went well. Things were pretty tight to begin with but loosened up quite quickly. Could be the Botox kicking in my I don’t think so because her left leg is spring loaded today. I can stretch it out well but it snaps back within minutes. I sat Janet on the side of the bed and did some “standing” with her. She actually seemed to like that as there was a bit of a smile after each time. She also liked the back straightening move Sean taught me. She always has had good posture. I gave her a few minutes rest then sat her up at the “desk”. She examined the notebook for a while then the pen. I thought she was actually going to write something as she held the pen correctly and put it to the paper then closed her eyes. Better than yesterday and we’ll keep trying. We went for a walk to the beach and around the neighborhood and Janet is back in her room having lunch. A few times today I really felt like Janet was trying to say something. Praying for communication and rapid healing. I’m feeling like Janet is continuing to gain awareness as I got more hugs today along with lots of looks, arm rubs and a couple attempts to say something. Today was split up differently for me as I am directing at Trinity this weekend. After a short lunch break I had just enough time to give Janet another stretch before taking off to church. Again she loosened up pretty quick but after I got her legs straight the left one popped back up in minutes. She doesn’t seem as uncomfortable when I stretch her now so I think the Botox is kicking in. 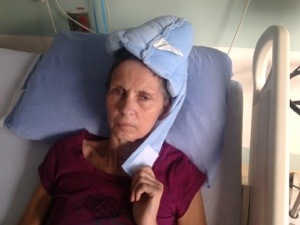 I left her cosy in bed with instructions to the nurses to get her back in the chair for dinner. I returned in the evening to find Janet back in bed sleeping and signs about infection control on her door. Turns out the tummy problems she was having were not related to the formula but the fact she has C diff. A superbug that causes diarrhea. She is being treated for it now and all visitors have to gown and glove up before going into her room. She may not be able to go outside for walks now either but I will check on that tomorrow. Apparently C diff. takes a couple weeks to clear up and Janet has shown symptoms for over a week now and although she still isn’t right I think she has past the peak. Janet stretched out really well tonight and I felt a strong connection throughout the visit. What i feel are attempts to speak are slight openings of the mouth with a look to the eyes like “are you listening?” Kinda hard to describe but I guess it’s more a look than any real sound although there is something there. Progress is being made. Praying for an end to the C diff. continued healing and an even brighter day tomorrow. Janet is having a little siesta so I have time to write this finally. Got here at 7:15 this morning and Janet was in Houdieno mode. Glad she was awake but breakfast had just finished so I was limited as to how hard I could work her out. Again she was pretty tight to start but everything except the left leg at the knee loosened up nicely. We got her cleaned up and into the chair and off I went to Trinity. Kiko spent most of the morning with Janet and I think it was relatively quiet. The C diff is not any worse and it does not appear to be taking too much of her energy. She had a little nap with Kiko around 11:30 and then again now. Kiko thinks she saw Janet move her right leg a couple times while sitting in the wheelchair. That would be a significant first and we all should watch for that please. As soon as Janet wakes it is off to the beach we go. To the beach we went but didn’t stay long as it was quite hot and Janet had a sweat on within minutes so we walked in the shade along Abbott St for a while. Sensing Janet wasn’t all that comfortable we headed back to her room. Sure enough she needed changing. She is battling this C diff. It’s not any worse but not any better yet either. I think it took a lot of Janet’s energy today. I elected to not give her the workout I had planned so she can rest and get the upper hand on this. We watched Jack’s message on Kindness and Janet was tuned in to it for sure. Watching intently for ten minutes at a time and making a variety of facial expressions. Jack has a very distinctive voice and is very familiar to Janet so I’m sure that helped. We had a little chat after that with me emphasizing her need to rest and get better. By six o’clock and after some half hearted Houdieno attempts she was sleeping peacefully. Praying for a restful and healing night and a productive day tomorrow. Houdieno was fully active this morning and her nurse said she had been at it since the start of the shift. Janet’s motivation seems to be more from discomfort than brightness as her energy level overall seems lower than normal still. The C diff. seems better today but Janet seems a little agitated when “awake” and has been napping a lot. Tom came in just before nine and he agreed to come back later in hopes Janet would have more energy. Chantelle from OT brought Janet a new wheelchair to try and also agreed to try later. This chair has less support so Janet will have to work harder to sit up and she may be able to drive it either with her left arm or legs. We’ll see. The Botox seems to be doing its thing as Janet is moving her left leg a lot and she is twisting her hips as well. It’ll be interesting to see how she does with Tom. Janet does not like me in gown & gloves. She keeps pushing the gown out of the way and she peeled both gloves off my hands. Thanks to Eve Carlson, a friend from Trinity who works for Interior Health, I made contact with two care facilities this morning. Visiting Sutherland Hills this afternoon and Mill Creek on Thursday. Praying for full and rapid healing. A very restful day for Janet. I got back from my tour of Sutherland Hills at three o’clock and Janet was snoozing away as she had been most of the time I was away. After a while I went on one of my roaming missions that were so effective in VGH and I bumped into Cathryn ( brain lady). Had a good chat and returned to Janet’s room by four and she was still sleeping soundly so I decided to come home where I could be more productive. I think it is good Janet had a rest day. Tom only did some basic stretching with her as even though her eyes were open you could tell she wasn’t fully herself. Rest will enable healing and the C diff. is better today than yesterday. Hopefully she rests tonight as well and she can be a little more active tomorrow. The people I met at Sutherland Hills are very nice and the facility seems clean and well run. The building itself is forty years old and 90% renovated but the renos don’t make it look any newer. My visit there solidified my feeling that this is all wrong for Janet. I see no benefit for her at all. My chat with Cathryn was good as always. I expressed my displeasure with the concept of moving Janet out and that I agree Janet is not rehab ready but moving to LTC is not going to improve her chances. I explained that I see Monika as the enemy right now and her decision seems to be based on KGH’s best interests not Janet’s. We also discussed the financial aspect of LTC and how absurd it is to ask someone to pay a rate based on income that no longer exists. I also asked Sutherland Hills about this but all they are is a funnel from the patient to Interior Health. They have no say in setting rates at all. I have a call out to IH to seek more info on this and Cathryn will investigate as well. She also intends to talk to Monika. The Hospitalist this week is Dr. Jones whom I really like and he mentioned a brain rehab clinic in Alberta that may be a possibility for Janet in the future. I look forward to talking with him more and hopefully Janet can shine brightly for him soon. Praying for a reversal of the decision to move Janet to LTC, for clarification of the financial side of things and for restful healing of Janet’s C diff. and rapid healing of her brain. Thanking God for the time I get to spend with Janet and all the kind and caring people I continue to meet along the way. The rest seems to have helped Houdieno. She has a little more energy today and has not needed to be changed as often. She even had an easy workout with Tom including twenty minutes on her tummy. She definitely is not as awake as she has been but is getting better. Surprisingly she has held her weight exactly from last week. I was not expecting that. I visited Cottonwoods this morning and feel it is a much better fit for Janet than Sutherland Hills. The facility is way brighter and spacious with more options for getting out and about. There is even a daycare on campus that I know Janet would benefit from visiting. The staff I met are very nice and more professional than Sutherland Hills. The manager even goes to Trinity so that is a good connection. I will visit Mill Creek on Thursday just for the sake of it but Cottonwoods looks like the place and with it being public we won’t have to pay for meds where we might have to at a private facility. I had another chat with Cathryn and she spoke to the Public Guardian and Trustee and encouraged me to call them as they may be able to help with the “power of attorney” thing without it costing thousands of dollars. She also spoke to Monika and clarified things with her. I need to sign Monika’s paper or the hospital will charge us full price to stay there after Sept. 8 and the rate for LTC would be stupid too. I will meet with Monika after touring Mill Creek on Thursday. Very busy day so far. Looking forward to Janet trying her new wheelchair this afternoon. Grateful for the picture becoming clearer. Larry, I thought I had a lot of gumption and tenacity…but you take the cake. I admire and applause your consistency in taking the very care of your beautiful wife. Jack and I continue to pray for complete healing. Complete!! And for strength and joy for you. Here Here! I second Heidi’s comments above- way to go Larry! I second your opnion on Sutherland Hills – dad Schlenker was there and it was good but I think you could find somewhere better for Janet and more convient for family and friends to visit. Big Hugs and still many prayers being offered up for both you and Janet! Janet was on the sleepy side again this afternoon so OTs Jane and Chantelle had to wake her up by sitting her on the edge of the bed. They did some assessment work with her. Unfortunately Janet was sleepy so did not perform as well as she could have. She did sit up well and looked up on command as well as leaned forward on command. Jane asked her repeatedly to put her left arm on Jane’s shoulder and I had to explain to Jane that you get better results from Janet if she understands why she is being asked to do something. If she sees the purpose she more often does it. Jane then asked Janet to put her left arm on her shoulder to keep her balance and Janet did it. That was about all we got from her as she kept falling asleep. Jane gave Janet her hair brush and asked her to brush her hair. Nothing but staring at the brush. Janet has always hated working with her hair. Jane and Chantelle put Janet in the new wheelchair and Janet tolerated it well but was too sleepy to try any tricks. Maybe tomorrow. The C diff. seems to be improving still as Janet’s changes are less frequent now. She woke up from her nap around five so I took her for a walk but she was asleep before we made it to the outside door. I walked her to the end of the block anyways so she could get some fresh air. I tucked her into bed for dinner time and a visit from Kiko and of course as I was doing so she woke up. Not sure what Kiko did but Houdieno was in full force during her visit getting herself sitting up high enough that her armpit was over the bed rail. A good lean in the right direction and she may have gotten out. Lots of left leg and hip movement from her as well. An exciting visit for Kiko. Sounds like Janet may have been a little agitated tonight and I have noticed brief instances of it too. She does not like me wearing gloves and peeled both of mine off me. She seems ok with the gown. Probably because it’s yellow. She was quite stubborn this afternoon in playing with her feed tube. I would tell her to stop and reach for her hand and she grabbed my hand first and pushed me away, let go and went right back to her feed tube. This defiant behavior went on for a while and I think is a good sign. Praying for more healing, clarity and awareness for tomorrow. She does indeed like yellow….especially in roses. Janet had a smile on her face when I arrived this morning. Either she was glad to see me or happy she was getting cleaned up. Maybe both? I got her loosened up pretty quick except for that left leg. Tom and Leanne came in and got Janet on the tilt table. A sweat producing workout for Janet and she stayed awake the whole time. Got the HR up to 133 and her BP stayed in a good range. A little stretching from Tom afterwards and it was off for a nap. If this wasn’t a bright day it at least had some bright moments. This afternoon Jane and Chantelle put Janet in her new wheelchair and took full advantage of her being awake. After a little coaching Janet was able to drive the chair herself! I have video and thought I could post it on CaringBridge but you can only do photos so once I figure out how to share this with you all I will. It was very cool to see and a few nurses stopped to watch as well. Very bright moment. Janet also got to go for a shower today. Doesn’t sound that exciting but when you haven’t had anything but cloth washes and three or four baths in three months it’s gotta feel pretty good. I expected her to konk out afterwards but she hung in there long enough for Cam to visit and me to stretch her out. Another bright moment followed stretching when I thought since she was still awake we’d go for a walk. I always ask her first, never expecting an answer but being courteous. I got her seated on the side of the bed to put her shirt on and I asked her if she wanted to go to the beach. She looked at me, then grabbed her pillow and pulled it closer to her. I asked her again and she pulled the pillow a little more, bent her arm and started to lay down. I took that as an emphatic no, helped her lay down, tucked her all in and within two minutes she was snoring away. Pretty bright. Twenty five minutes later I was dressed for my bike ride home, said goodnight and boom, eyes open. So hard to establish a routine with her these days. I left anyways knowing she is in good hands. Praying for rapid healing, more development of communication and a productive day tomorrow. Today started out sleepy with Janet out till 9:30. When she did open her eyes she immediately tried taking the splint off her right arm. She was able to lift that arm up and position it where she could get at the first strap but couldn’t pull it out from underneath. I helped her the rest of the way and started a little stretching with her. I think everything was looser this morning and she certainly didn’t complain about pain as much. Tom and Leanne arrived shortly after I started stretching her and got her up on the side of the bed to do some assessment exercises and getting her to recover herself from leaning over. They also bent her forward enough to touch her toes with her left hand. Janet did well considering she had not been awake long. Tom is a good guy and sure knows what he is doing but after working with Sean for a couple weeks I think his more aggressive approach is better for Janet and something she would prefer if she could choose. Sean did a lot of new things with Janet and Tom is doing the same old things, all of which I can do with her except the tilt table. Something to consider when we have to hire outside. Speaking of outside, I got Janet out for a walk this morning. It was a little cool at the beach in the breeze but walking around the neighborhood was really nice. Janet responded well to me asking her to put her hat on, put her glasses on, take her glasses off and put her sunglasses on and put her sunglasses back on after she took them off. Very nice to have her cooperate like that. As we were walking we met a lady walking her little white dog. We stopped to say hi and the lady held the dog up on Janet’s lap. She patted the dog much like she did Nash a few weeks ago, knowing it was a dog but not really making a connection. Still cool. The C diff. seems to be clearing up. Janet was changed only once last night then early this morning and was fine when I left at 12:15. Good sign. Touring Mill Creek Retirement Home this afternoon. This is the last tour I have scheduled and I’ll talk to Monika tomorrow, hopefully putting a clear plan in place. Praying for continued healing and increasing awareness as well as wisdom regarding the move out of hospital. Not as much activity with Janet this afternoon mostly because of me being late with my tour of Mill Creek. Houdieno was in bed when I returned as instructed but both lower side rails were down and the fall mat was not in place. Houdieno was doing her thing on the right side of the bed and really would have a tough time getting out that side but I still wasn’t impressed. I showed the charge nurse just so she is aware and she said their fall prevention manual says lower rails are to be down. Not sure why. She will put a comment about the fall mat for other nurses to see. I did some really good stretching with Janet, even got the left leg as straight as the right one. First time. I sat Janet up on the side of the bed and did some posture work with her and also some standing. She did really well with that and I hope to show Tom tomorrow to make sure I’m doing it right and so he can see what she is capable of. Next was the school desk and once again she closed her eyes before doing much of anything. I thought she liked school. While she napped I went roaming in search of Cathryn and found her in her office. Told her my tour of Mill Creek confused me even more. It is a very nice facility that everyone seems to want to go to. There were five others on the tour with me. Right away I sensed this was not the place for Janet as all the talk was about making it “home”. Not interested in that. I asked about rehab/Physio and was told there is a Physio therapist and a rehab assistant onsite every day but the tour guide did not know how often each resident would get treatment. After our first stop on the tour we passed the physio’s office and she was there so I broke off from the tour to have a chat. Valerie explained she is there 27.5 hour a week and the rehab girl another 24 hours. She said this facility would give Janet the most attention in a rehab sort of way. Valerie used to work at Cottonwoods and said she left for a change and did not bad mouth it but did everything to praise Mill Creek without telling me to choose it. I was hoping to scratch it off my list and go with Cottonwoods but now I think I have to wait for the meeting with Monika. Cathryn cautioned that the chances of getting into Mill Creek are slim and it likely is more expensive. There may be more availability of Physio but it won’t be daily and it won’t be anymore in depth that any other facility. If Janet is seen to be progressing anywhere, she will immediately get more attention. Still leaning towards Cottonwoods but some questions remain. I will ask Monika to invite the Community Care Coordinator to the meeting as well. Interior Health says she ought to be able to answer my money questions. Cathryn had spoken to her manager about our case and feels that Team Save Janet along with a little outside help can do what Janet needs to continue making progress. She is going to get us the info on what criteria Janet has to meet to get to the various rehab facilities. I am comfortable with the Physio aspect of things and confident TSJ can handle that part. I asked Cathryn if there was anything more we could do neurologically and she said no, keep up the reading and singing etc. Go Team! Houdieno was back at it when I returned and unfortunately having dinner so I could not put her in the new wheelchair. We read a little and played with the iPad a little but she was more intent on escaping. Mary Gaga called just at the end my visit and Janet looked at the phone pretty much the whole four minutes. She knows and likes her mother’s voice. Praying for a restful and healing night for Janet and wisdom for my meeting tomorrow. Strong day so far for Janet. She was doing a little Houdieno when I arrived then her nurses came in to clean her up. C diff. seems to be waning and judging by Janet’s energy level, she is feeling better. I got her stretched out really well, best yet, and all ready for Tom. He and Liz arrived and we started by correcting my technique for sitting and standing Janet. It’s amazing how much easier things are if you do them the right way. Janet did really well and was alert through the entire workout. She made us laugh when I was demonstrating standing her up as she untied my gown and started pulling if off my shoulders. I swear she was laughing at my technique too. Each time I sat her back down I sensed a smirk on her face. Tom and Liz put her on her tummy and I monitored her for a solid thirty five minutes. She changed her head and arm position on her own and even had a short nap. Tom would like to see this as part of the regular positioning routine. Not sure if we can get the nurses to do it but worth an ask. Thankful for such a bright day so far. Best day since the start of C diff. for Janet. It’s not officially gone but virtually is. Janet was sleeping when I returned after lunch which gave me good time to talk to Monika. The other lady I wanted in on the meeting was not available so it was Monika and I. Bottom line is, Janet is not ready for rehab, agree. Janet can no longer “wait” at the hospital, I understand. If I don’t sign the form Monika needs me to Janet’s fees will default to the maximum amounts, fine, I’ll sign when I get the final word on the rate. Janet will be monitored by Cathryn, Dr. McCann and the residence’s Physio therapist, good. Janet will move to a rehab program when qualified, good. PGT will nominate and appoint me “Guardian”, they never offered that to me on the phone nor is that mentioned anywhere on the website. Monika thought that strange and suggested I talk to Wendy the social worker, I will. The provincial government dictates the formula for establishing rates for residential care, there does not seem to be a way to argue it but Lynn the Access Coordinator will have the details, I should talk to her. I will. Cottonwoods will be the most cost effective place and they have as much Physio and OT as anywhere else. Cottonwoods it is. First available bed could be anywhere anytime. Hurry up and wait. Janet is making progress. Indeed she is. When Janet woke up we did a little stretching then got into the new wheelchair. Janet did a great job wheeling herself out of her room to the nurses station. She would stop everytime she noticed someone watching her but with some encouragement she would continue. I made sure Monika saw her and it was fun to watch the surprised looks on everyone’s faces as Janet wheeled around. We tried going down the hall but it was quite busy and Janet was clearly wanting to stay out of people’s way. I decided to get her hat and sunglasses and head outside. Janet wheeled herself quite a ways towards the beach. She would go as much as ten or twelve feet then stop for a rest. Out on Pandosy St. we sat beside some people with a cute little dog named Waldo. Janet patted him a couple times but I still didn’t see any connection between her and the dog. We’ll have to try Nash soon to see if she knows him. Janet wheeled herself really well heading back into the hospital but up on her floor and headed for her room she figured out how to go in reverse and to push back using the wall. She did not want to go to her room! We had to though for dinner and to await the arrival of Mr. and Mrs. Korotana. Laurel hung out with Janet till 8:30, reading and stretching and sleeping. I arrived to pick her up and helped get Janet ready for bed. She needed changing for only the second time today! C diff. is on its way out! I said goodbye to student nurse Leah. It was her last shift tonight before starting third year with a placement in Penticton. She was very good to Janet each time she worked with her and even showed up at our house during Cam’s soccer party last week. She told me she had a dream about Janet talking today. It was so vivid she woke up and fell out of bed. Kiko had a similar dream last night and I had one the night before. Impossible to not think God is up to something. Praying for immediate and full healing and for an active learning weekend. Laurel has taken today’s first shift and with her Wind powered phone is unable to post an update so here goes. It has been a pretty quiet morning with Janet sleeping off and on making it difficult for Laurel to do much with her. She feels Janet did follow a command with the incentive of having her splint removed. I will do the afternoon shift and see if we can get Houdieno back in action. Looking forward to the Team Save Janet gathering at Jack and Heidi’s tonight! Larry, we are SO looking forward to having you, Laurel and all the Team Save Janet on our deck tonight. It will be a glorious night!! CLEARLY! God is up to something Larry. We’ll wait upon the Lord as long as it takes! REALLY looking forward to tonight! So sorry we missed tonight! hope it was inspiring and relaxing! Continued prayers for Janet this weekend! Janet was still in sleep mode when I arrived this afternoon. Twenty minutes later she was raring to go. We had a good stretch and an excellent time sitting on the edge of the bed and “standing”. I probably had her standing straighter and for longer than ever before and I think she enjoyed it. I put her in the new wheelchair and she drove it out the door and around the hallway a little bit. She’s still not totally confident with it and doesn’t always try as hard as she could but often she gets on a real roll. Sorry. We did our walk to the beach and along Abbott St. thing and Janet got a little agitated for a bit, taking her hat off and almost chucking it away, throwing her sunglasses to the ground and doing an extreme Monkey. Not sure what that was all about but we headed back to the hospital. She had calmed down by the time we got there so as we sat in the shade on Pandosy St. I asked her what was wrong and she grabbed her shirt at the chest and pulled at it a couple times as if to say “I’m hot”. Back to the room we went, got in bed, had the nurses change her and off to sleep she went. That was a busy three hours so good reason to sleep. Laurel and I headed to Jack and Heidi’s for dinner with some of the Team Save Janet crew this evening. It was so nice to sit on their beautiful deck on such a warm Okanagan summer evening with great people and good food. We are blessed in so many ways. Thank you Jack and Heidi for being there for Janet right from day one and come to think of it right from our very first days at Trinity too. I am so glad to call you friends. Thanks to the rest of the team as well. I could not be doing this without your help and support. Laurel and I stopped by to say goodnight to Janet. Glad we did as she was not in the greatest position and was really warm and didn’t have her booties or splint on. I got her nurses to come in and fix her up and take her temperature. She was fine and probably just had too many blankets on. Laurel noticed some small marks on the side of her right hand. I’m thinking that must have happened when her arm slipped off the hand rail on the wheelchair. The nurses cleaned and bandaged a couple of them just in case and we will all watch them closely tomorrow to make sure they stay clean. Even with a good nursing crew on duty I love showing up unexpectedly like that and being able to point out a few things that aren’t quite right. In a loving way of course. Grateful for the love and support from Team Save Janet and praying for rapid and complete healing. On site team shift change is complete with Laurel heading for the pool I hope. Janet was awake for most of the morning shift and her and Laurel did lots of stretching, reading and chatting. Dr. Jones stopped by for a chat and as he said and waved goodbye to Janet, she waved back! He repeated his goodbye and so did Janet. His words were “that is profound, that is tremendous”. I’m hoping those comments make it into his notes for the next Hospitalist. The nurses got Janet into her new wheelchair this afternoon and Laurel got her all set for a walk to the beach. Of course Janet fell asleep before making it outside. She is resting now and I’ll put her through her paces as soon as she’s ready. Grateful for being able to live in this beautiful city and be a part of a loving community. Looking forward to some quality time with Janet and thanking God for every minute I get with her. Janet woke up twenty minutes after I got to her room and we did some stretching. She was very limber so Laurel must have done a great job earlier. I sat her up on the side of the bed and did some standing with her. The second time she was up I asked her to stand up straight and look up. She lifted her head and upper body to a point where she was maybe thirty degrees off of standing straight. Very cool. After that I sensed she was a little tired so I got her into the old wheelchair to see if she would stay awake enough to go for a walk. She did not so I decided to give her a manicure. Some of the bruising is coming off her nails but it looks like she may lose a couple of them soon. Thanks nurse Ashley, we will never forget you. Janet woke up just before I finished her nails but it was too close to dinner time to go for a walk so back to bed to get changed and then dinner was served. She was fairly bright so I tried a little instruction time. She was holding her left hand out in front of her admiring my paint job so I put my hand up beside her and asked her to show me one finger. She did not respond at all so I leaned in and told her that one day Dr. McCann will come in and ask her questions like this and if she gets them right he will be able to help her get better faster, if she gets them wrong then we have to wait longer. We set the drill up again and the second time I asked her to show me one finger, she did! It wasn’t the middle one either. It was the “number one” finger which I hope to designate as the sign for yes. A closed fist will be no. Hopefully. She nodded off for a bit so I came home for dinner. Laurel and I returned to say goodnight later on and she was snoozing comfortably. She did open her eyes after we started saying goodnight but never really engaged us much which hopefully means she will sleep well tonight. Praying for a productive and healing day tomorrow. Thanks for your update Kiko. Your phone must be solar powered not Wind like Laurel’s. Janet does like to sit up and I’m glad you helped her with that. Nice job with the leg movement too. I notice a lot going on there this afternoon as well. Laurel had the morning shift again today and is now headed back to Calgary. Janet has gotten quite good at taking the first strap off of her splint. So good that she has managed to lose it. OT cut me a new one. Tom was in for a workout this morning and tried getting Janet to write. No go and Laurel thinks Tom didn’t give her enough set up time or reason to do it. She tried Janet on it afterwards and managed to get a little scribbling out of her. First time! Tom felt uncomfortable working with Janet in just a top so he put her new PJ shorts on her. Bad move. C diff. not gone yet. Janet seems to be in a good space today. Going to stretch her out in a bit then go for a walk hopefully. The stretching went well and I can tell Janet has an increased ability to move her pelvis and left leg. Not sure how much stretching she got earlier in the day but she seems a little tighter from the hips up. Yesterday when I stretched her hips there was good separation with everything. Today I really had to hold her opposite shoulder down to get a good stretch. I’ll ask Tom tomorrow. Janet sat up on the edge of the bed and did some really good standing. It takes a lot out of her but she seems really happy about it and is right there for a high five after each one. I laid her down so I could get the wheelchair ready and gave her a little hug just before helping her up again I swear she gave me a peck on the cheek. I asked her if that was a kiss and she just looked at me with a ” you tell me” kinda look. I got her in the new wheelchair which she drove a little bit. Maybe I wasn’t as patient with her today but she seemed to need more coaching and encouragement. Laurel left me a hand written note (old school) saying there was a mishap with Janet in that wheelchair this morning. Tom was with her and there was tipping involved. Janet did not fall out or anything but seemed quite upset about it all. Probably affected her performance this afternoon. I talked to Jane the OT about it and she couldn’t think of anyway someone as small average as Janet could tip that chair. She will talk to Tom tomorrow as well. I also told her about the wave Janet gave Dr. Jones. She thought that was great and “that’s what everyone is waiting for”. Keep it coming Janet. We made it half way down the hall before Janet fell asleep so back to the room we went. I put her in the old wheelchair and she woke right up! Off to the beach it was. It felt quiet out there today with the weekend crowds gone and Janet seemed to be watching things more with less commotion going on. Back in the room, Sandi arrived for a visit all decked out in her bright yellow Team Save Janet t shirt. Nice! With Sandi there and Janet’s dinner starting soon I headed home to cut the lawn and have my dinner. As I was getting ready to leave and Janet’s nurse was getting her tube feed ready we both heard what sounded like an attempt to talk from Janet. Neither of us were right beside her at the time but we both heard it and thought it was more than a throat clearing or something. She never repeated it. When I returned Janet was all cozy and sleepy in bed. I woke her up cause it was only 7:30 and I wanted to stretch her again before bed. I got her legs straightened out quite easily but I’m still a little concerned about her hips. Once she was all tucked in I read a bible verse to her, looked up, and she was asleep. Its not just you Wayne. Praying for wisdom as I try and talk to the social worker and access coordinator tomorrow. Praying for Janet to be fully healed. Busy day so far for Janet. She was sleeping when I arrived then her nurses came in to wash her up. Reports are that the C diff. is pretty much done. The run of medication Janet was on for it has ended so if all is good for a couple days we can lose the gowns and gloves. Yay! Tom and Leanne arrived right after the nurses left. I misunderstood Laurel’s note about the tipping chair yesterday. It was not the new wheelchair Janet was in but one of the desk chairs we sit in. Tom had her in one with the “desk” pulled in front trying to get her to write. He didn’t offer an explanation for the tipping incident but I think he feels like he went one step too far with Janet yesterday. This morning they put Janet on the tilt table for thirty minutes and she tolerated it very well. The best yet. She only got agitated in the last five to ten minutes and let out a big sigh of relief when she got back down to level. It was weigh in day for Janet today and I got teach Arlene and Kristi how to weigh Janet using the sling. Neither of them had done it before. My resume keeps building. Wish I could have gotten a bigger number as Janet has lost a little weight this time. Hopefully when the C diff. is gone they can ramp up the formula a bit. Janet is napping now getting ready for an active afternoon. Heidi was visiting Janet when I returned after lunch. She was stylin in her bright green Team Save Janet t shirt. Janet had a short nap after that and I was able to stretch her out when she woke up. She is much looser today than yesterday. I think the tilt table helped this morning and perhaps her calmness today. She was a little mellow most of the day. Carrie dropped by (not in regulation TSJ gear) for a chat. Always good to have your positive energy and soothing presence in the room Carrie. Thanks for the love you pour into Janet and all of the family. Janet was very active after some stretching so I decided to try some standing from sitting work with her. Once again after a couple tries she was able to get super close to straight up and she was smiling the whole time. I can tell its a workout for her but she loves it. Social Worker, Wendy, came in during this part of the workout so I let Janet sit in on the conversation. I asked Wendy for clarification on this Committee of Estate thing and if the Provincial Guardian and Trustee would actually appoint me Committee of Janet. She had not heard of that before but would call them to find out for sure. She thinks it’s pay the lawyers or designate the PGT to administer Janet’s life. Lawyers it is unless she learns different. We also talked about Janet’s condition and if Dr. Jones had spoken to me. I said we had chatted a few times. She meant serious sit down map out a plan for Janet. I said no. Wendy said he had written in the chart and mentioned to the charge nurse that he would have that conversation with me instead of another team meeting. Wendy implied that there may be reason for Dr. McCann to reassess Janet in light of the progress she is making. I’m not getting my hopes up and I think one thing that prevented that discussion is Dr. McCann is still on vacation. Maybe next week. Janet sat on the edge of the bed unassisted, watching and listening the whole twenty minutes Wendy was in the room. She was very bright and Wendy noticed that for sure. Cool. I got her into the new wheelchair and we called Mary/Gaga. Again, Janet was tuned in the whole time her mom was talking. Janet drove her wheelchair all the way from her bed to outside the door in one go. Arlene watched her and got a little teary eyed. She hadn’t seen Janet do that yet. The hallway was a little busy so I drove to the elevators where I helped Janet get her hand to the button and she pushed it by herself for the first time. We headed for rehab as earlier in the day I found a room with a large mirror in it and I wanted Janet to see herself for the first time in three months. The mirror I was aiming for was not in the greatest spot but thankfully a physiotherapist was there and turned around this cool mirror on wheels for us to use. It’s hard to gauge Janet’s reaction. I think she knew she was looking at herself as she seemed a little overwhelmed and emotional kinda like the first times we went out into the ward. I’m still really unsure of what exactly she sees too. We went to the beach but felt a couple raindrops so headed back in. Good thing too as Janet F. had arrived for her visit. We owe you a t shirt Janet. Remind me next time. Janet loved reading a Dr. Seuss book Janet F. brought in. During dinner I coached Janet on the hand signals for yes and no. I think she’s catching on. We called Andrew to wish him a late happy birthday. Janet certainly recognized the voice and I think we’ll do more of this. Dinner ended and Christi and I put Janet to bed and she was asleep by 7:15. Solid day. Praying for complete healing and giving thanks for the love from so many people. Hard to believe but here it is. Seems like another lifetime ago that this all started. Janet has had a good day so far despite the C diff. spiking up a little. It would appear as though she had a bit of a restless night as her blankets were all askew and she was in Houdieno position when I arrived. She managed to take off two straps and the splint and toss it on the floor. She couldn’t quite get the sleeve off but she sure tried. Tom and Leanne put her on her tummy for about thirty minutes this morning. Janet seemed a little uncomfortable this time and I think it was the C diff. Her legs responded really well though and she turned her head on command a number of times. I took her for a walk in the old wheelchair and she had a nice fifteen minute nap in the sun at the beach. I spoke to the Access Coordinator, Lynn, and she gave me some interesting info on the residential care rates. I won’t go into detail here but will get to work on what she suggested. Wendy confirmed that Committee of Estate through a lawyer is the only way for me to get signing authority over Janet. Once I figure out when I need it I will start the process. In honor of day 100 I put together a little video depicting some of Janet’s achievements to date. Please use the link below to view the video. It is a private video not to be re posted or shared anywhere else. The password to view it is Houdieno. Grateful for the progress made over these first 100 days and praying for full healing. I can hardly wait to show Jim the film tonight. Well done Janet and all the supporting cast. We’re bawling here at Trinity!! Thank you for that. It’s so good to see Mom. Great progress Janet!!! Hopefully I’ll have a chance to visit this week. During my lunch break, Cam stopped by but Janet was snoring away. Brenda visited Janet not long after that and read a couple books with her. I returned shortly after to find Janet awake and begging to be put to bed for some stretching. Well maybe not begging. We had a decent workout ending with some “standing”. She fell asleep minutes afterwards just as Cam showed up. You should stick to your late night shift Cam. Janet had quite a long afternoon nap so she really must have been awake lots last night. I considered leaving but she woke up shortly after four and we practiced sign language. I was surprised to learn that what I had started teaching her for no is actually yes. No wonder she wasn’t doing it. I actually got some really good attempts at making the signs as if she remembers from teaching it at preschool. I also tried getting her to say hi. With some help she would open her mouth and exhale loudly. A few times she did it without help. I think she made a really good effort to speak. After her dinner we went for a sunset walk to the beach. Too windy to stay long but it seemed to invigorate Janet as she did really well driving the new wheelchair back on her ward. Best yet. She was so cute as she wheeled up to the desk at the nurses station as if she wanted to talk to them. She had a nice happy face on and possibly was sensing a little freedom. Didn’t last long though as I got her back in bed, stretched out and tucked in so I could ride home before dark which is happening way too early now. A successful day 100. Praying for ten times as much improvement over the next hundred. Thank you so much for showing us the video of Janet’s achievements Larry. It brought tears to my eyes. She has accomplished so much in 100 days thanks to you and our Lord. GO JANET GO!!! Could you hear that all the way from Saskatchewan. We are all cheering for you out this way Janet. Keep up the good work everyone. Oh Larry this is amazing! Wow such great progress Janet. Go Team Go Janet GO GOD!!! Slow start today. Janet sleepy till 9:30 or so. We practiced some sign language and “talking” before Tom showed up. Her nurse came in to give Janet’s meds and I asked about the antacid. Wondering if it’s still needed. She didn’t know but the Hospitalist was right outside the door so I asked him, he checked Janet’s chart and agreed to take her off it. Yay! One less med. I stretched Janet out and had her sitting on the edge of the bed when Tom arrived which wasn’t till 11:30. I guessed right though as he wanted to try a sliding board to transfer Janet from bed to wheelchair. It forces her to participate and for a first time she did well. Tom will try and find a slipperier one and teach me how to help her. Janet was back to sleep right as Tom was done so I left to go do some pool and yard work. I’ve also been on the phone a lot with CPP and IH. Janet has been approved for CPP Disability but the amount is less than what LTC rent will be. Still working on it and making progress. Getting amazing help in both departments. Going for a walk now. Must be chilly in Kelowna if you aren’t jumping in the pool. Not at all. Have to clean it sometime. Home early! Janet fell asleep around five so I bolted as I have lots I can do away from the hospital. She was awake in her chair when I arrived this afternoon so after posting the update and reading a card sent from Rita (Raju’s sister) we went out for a walk. I got a damp cloth to wipe her mouth before we went out and she grabbed it from my hand and did it herself. A first! Laurel really ought to be here now as there is more than enough wind to power her phone. Janet knew to hold onto her hat without being told. Very impressive. One gust caught us both by surprise though and I had to go for a run to retrieve her hat. Janet was very aware of the wind, the large waves at the beach and the noise associated with that. I think it was good for her. We managed to find a sunny quiet spot for a bit and call Mary/Gaga. I think there were too many distractions outside to allow Janet to focus on her mom’s voice but there were moments when she was tuned in. Cam met us in the hall on the way back and saw his mom awake during the day for the first time in a while. Janet brightened right up when she saw him. I thought we might get a “hi” or a wave but no. After a really good stretch Janet was out and so was I. Kind of a quiet day overall for Janet which good because I was busy. Hopefully Janet has a restful night and an active and progressive day tomorrow. Another sleepy start to the day. Janet was being changed when I arrived and the girls wanted to change her whole bed so I let them put Janet in the wheelchair. Of course she went right back to sleep and stayed that way till Tom showed up at 10:30. We put her on the tilt table and that sure woke her up. I had no chance to stretch her before that and Tom went pretty easy on her before raising her on the table. She had a real sweaty workout “standing” there for forty minutes and showed us that that is about her limit. When Tom let her down she was quite uncomfortable and her legs were shaking and her back was arched. I was quite concerned but Tom explained how hard that table is and how little padding Janet has so the pressure of being on there that long was uncomfortable. As soon as we flew her back to bed she relaxed and everything loosened up. By then it was lunch time so of course she went to sleep. The dietician stopped by to discuss her formula and wants to switch to the high calorie formula again even with the C diff. still present. She tried telling me that Janet’s weight is stable but I told her she lost some since the last weigh in. We checked the chart and Janet’s weight was incorrectly entered as being the same as the last two times. I told her the correct weight and that I know because I did it twice that day. Grrrr. The dietician also mentioned that Janet’s phosphorus count is climbing again. Not potassium as previously reported. The new formula will correct that as well. I asked how the phosphorus is measured and she said blood work once a week. I explained the high frequency of vampire visits lately and that the Hospitalist had put a stop to that. She promised to inform me what gets ordered for that. I actually stopped a vampire from entering Janet’s room today. I asked her if she was going in to see Janet and she said yes. We went to the nurses station to confirm and turns out the vampire had the wrong name and room number. I’m hoping that if I wasn’t there to stop her she would have realized her error when she checked the wrist band. Would be interesting to know. Still working on the LTC situation and making some progress. Jane the OT is going to work with Janet in the new wheelchair this afternoon and also with a large mirror. Should be fun. Praying Janet is awake and at her brightest. A pretty good afternoon shift for Janet. I had her all ready for Jane just after two and we got her into the new wheelchair using the sliding board. Janet instinctively used her left arm to balance and try to move herself and I can see that with a shorter and slipperier board she could learn to do this on her own. She also needs to gain control of her left leg as well and hopefully with lots of experience like this she will get it going. Wayne arrived for a visit just as Janet started wheeling out the door. He was out of Team Save Janet uniform and I think that motivated Janet to wheel harder toward him. Jane was happy with Janet’s performance but I know she can do better as she was just breaking out of her slumber. Jane suggested I have a talk with Dr. McCann re Janet’s progress and I will next week for sure. Again, I’m not getting my hopes up but will keep praying that Janet makes enough progress to avoid LTC. We went for a little walk after the session with Jane and Janet got more and more alert as the afternoon went on. She was really watching cars and people and looking at me with a quizzical look from time to time. One time she even made an obvious gesture that she was annoyed with the cigarette smoke wafting over from some patient smoking just off the property. She rubbed her nose, frowned and looked at me like “eew”. I continue to try and get her to say hi or give me the sign for yes. She mimicked that well once today and you can really see her thinking and trying to figure things out when asked to talk or sign. During one signing attempt she seemed to be counting her fingers, bringing them up one at a time from a fist. That’s a first that I’ve seen. She had a nap during most of her dinner and that gave me time to work on the LTC money issue. Hopefully will get this resolved next week. We did a little sitting up and reading and talking before I stretched her out for bed. No sign of C diff. since a change first thing this morning. Yay! Praying for a restful and healing night. A safe drive from Calgary for Laurel and a progressive day tomorrow. Much brighter start today. Janet woke up as I came into the room and was quite intent on listening to me chat to her. She was really looking at me, had a smiley face on and often reached out to rub my arm or shoulder. Her nurse came in and we got her medicated, cleaned and dressed then it was time for some stretching. That went reasonably well but Janet is still kinda tight on the left hip/pelvis and hamstring. The right arm is better today and the more we can exercise it the better. Janet was exploring the fingers on her right hand this morning using her left hand to lift each one up and rub it a little. First time I’ve seen that. We attempted to go for a walk but once Janet was in the wheelchair sitting in the sun waiting for me to change out of my gloves and gown, she fell asleep. Praying for brighter and brighter days. It turned out to be a fairly bright day for Janet. Her morning nap was brief and we did some reading, writing, grooming, talking and gawking over lunch. When Janet wakes up she is usually a little slow to get going so I gave her a magazine to look at first. She leafed through a bunch of pages first then went one by one till she found a very colorful ad on one page and she really looked at that for a while. She also paused at a half page photo of Ellen and I reminded her who that was but I think she recognized her. I tried with the pen and paper thing again with no luck but Janet did finally brush her hair! Just a couple strokes and not well aimed but she did it without coaching or hesitating. I sensed she was quite bright so I tried to get her to say something like hi or aah. She will open her mouth on command now sometimes but there was no real effort to speak today. Janet is getting better with the sign language as she now will mimic the sign for yes consistently. I used the speech therapy mirror with her as well but I don’t think she sees well enough to really know what she’s looking at. She was comfortable touching the mirror today so that is a good step. After lunch it was back to bed for a stretch and some sitting/standing. Janet stayed awake through that so into the new wheelchair she went. By far her best effort at driving today. Long spurts of wheeling and way more confident in the chair. I can walk beside and in front of her now and she’ll follow where if I did that before she seemed scared to do anything. Good progress. I drove as we walked to the beach and back. The sun felt good and Janet was looking around a lot. I stopped a few times where she could look closely and touch some flowers. Previously she would be startled a little to touch something like that but she seems more confident now. I put her into bed to wait for Laurel and headed home for lunch. Laurel reports that her mom slept till about 4:30 then was quite active the rest of her shift. Laurel was successful in getting Janet to write on some paper! Well, scribble, but still. Apparently the pen I was giving Janet was not good enough for her as she loved the clicky pen Laurel gave her. She started clicking it right away and when Laurel held a piece of paper out in front of her she put the pen to it and made scribbly marks. Cool. Praying for a restful and healing night and a communicative day tomorrow. 1. Janet was holding her right hand with her left, so I got her to exercise her right hand herself. I would tell her ‘up’ and ‘down’ and she would move her right arm (bending at the elbow) with the left arm on command! 2. She had her eyes closed while she took off one of the straps on her splint. I asked her if she wants to give me the strap she was holding and boom, her eyes opened and without hesitation she handed me her strap. Cool. A quiet morning with Mom. She appeared to be asleep when I arrived, but opened her eyes as soon as I began talking. Worked a lot with her right arm, making it reach around to touch other parts of her body and helping her to move it around. She appears very focused when this is happening, although I don’t know on what. I again gave her the pen and paper, and with some prompting she made some more scribbles. She doesn’t ever want to do it for long, but she doesn’t seem to mind it as she’s doing it. I used her hand to write a (very messy) sentence – thought it was worth a try. Later, Mom was put in her wheelchair but fell alseep just as we were about to head out. Fortunately, she woke up as we got to the elevators and Suzanne stepped out for a visit. Nice timing! We went outside for a little, but Mom needed to be back for lunch, and on the way back she fell alseep. Proceeded to sleep for almost two hours before I decided to head home for some lunch. Hopefully Larry can have some more awake time when he arrives this afternoon! Back to School help needed. I am driving Cam back to school in Calgary this coming Friday and would love it if you Kelowna team members could visit Janet while I’m away. Coverage is needed Friday August 31st from noon till 8pm and Saturday September 1st from 8am till 4pm. If you are able to help out for any length of time either day please let me know. This week is also good if anyone wants to train to do some range of motion work with her. I would be happy to run you through the basics at your convenience. Janet was raring to go when I arrived just before three. She was in Houdieno mode and very bright. Even bright enough to smile at me a couple times. The smile quickly vanished as I started stretching her as the left hip/pelvis and leg are still tighter than I think they should be now with the Botox. She started smiling again when I sat her up on the edge of the bed then did some “standing”. She really does enjoy sitting by herself especially when I help straighten her back. Her face lights up each time. She even brushed her hair a few times. We went for our customary walk to the beach with Janet wheeling her chair from her room to the elevators in record time. By the time we were at the beach Janet was clearly not comfortable. She was leaning forward a lot to grab her left knee and move that leg to the right. She seemed better as long as we were moving but I did cut the walk short and as I sat her on the edge of the bed she very deliberately put her left arm down and started to lean over clearly “saying” she wanted to lay down. She seemed relieved almost immediately. After a short rest we called Heather and Janet was focused on her voice most of the time. She looked perplexed sometimes too but that is a common expression people have when listening to Heather. School was in for a while next. Janet seemed very interested when I wrote her name on the iPad using iblackboard. Maybe she recognized her name or maybe my writing, nevertheless it was a good reaction and I will try other words with it next. Tried to get her to write or draw something on it but only got a few taps out of her. I played a couple speech therapy songs for her and she seemed to watch each one very closely. I had lots of interaction with Janet today. Lots of eye contact, touching, it even felt like she leaned in to give me a kiss once. She fell asleep by six and was still snoring at 7:30 when I left but the time she was awake she was very awake. Praying for a productive day tomorrow. Sleepy day so far for Janet. She was in Houdieno mode when I arrived and her nurse came in to clean her up. A test is being done to see if the C diff. is gone. Sure hope so. Started stretching Janet and despite being quite tight to begin she loosened up quite well. Likely due to her falling asleep half way through the workout. I waited for Tom with Janet all limbered up and ready to go but by 10:30 I had not even seen him on the ward yet so I sat Janet up on the side of the bed and did some standing with her. I also just let her sit there for about fifteen minutes and each time she leaned over to the right too far she would grab my arm or shoulder and correct herself. Nice. Got her into the new wheelchair using the sliding board and was already for a drive around the ward and back to sleep she went. I sat with her for a few minutes to see if it was just a power snooze then Tom came in. He used the sliding board to get her back on the bed and she woke up as soon as he started working with her. Seeing Tom work the sliding board was good for me as I now know to put Janet’s arm out way farther than I was so she can pull herself more than lift and slide. I put Janet into the regular chair after her workout as she was sleepy again. I went roaming in search of Dr. McCann and saw Cathryn. She is still working on the rehab criteria. Progress is being made on the LTC rates thanks to lots of help from the Access Coordinator. Had a chat with this week’s Hospitalist and he was pleased to hear of Janet’s progress. He actually had an aneurysm that was diagnosed before it ruptured. Obviously he was treated successfully and I look forward to talking to him about it some more. Larry, thank you so much for these detailed updates…they are like reading a novel where I can’t wait to turn the page and see what happens next. I will be there tomorrow, and besides reading..what can I do? You are a visible example of the sacrificial love that Jesus pours out on all of us. May God give you the strength and gumption to keep it up and keep it going. Hugs…Heidi NEVER GIVE UP!!! Mom was in her chair when I arrived this afternoon but looking somewhat uncomfortable so was fairly quickly put back to bed. She had a good snooze once in bed, and then woke up for some chatting and reading. I felt she looked more “focused” on listening as I got to some particularly good parts in Anne of Green Gables today, but that may have been an overly optimistic impression on my part. She didn’t want to try any writing/scribbling today, but when I gave her the hairbrush and asked her to brush her hair she quite quickly used it to appropriately stroke the side of her head. Nice job, Mom! She also was very quick and “on target” with her high fives today. She later had another nap and then woke up for a nice visit from Wendy. We did some stretching and then it was time to say goodnight. Oh, and good news of the day…the lab test indicated C Diff is gone! Apparently we are to keep the gowns and gloves on for another couple of days, but the end is in sight! Heidi. Reading is awesome. If you want to try the speech therapy mirror it is in the room. So far she hasn’t shown much interest but the more we try it the more likely it is she’ll figure it out. Brushing her hair in front of it is a good one and being in it with her and talking helps her realize what she’s looking at. The hardest part has been putting somewhere where you don’t have to hang onto it. I’ll try in the morning and leave it for you. Busy day so far. Janet popped her eyes open as soon as I said good morning. She was in a half Houdieno move and gave me a little smile. Christi came in and we cleaned her up and changed her. Janet is a favorite of so many nurses, it’s pretty cool. Christi did mention Janet’s heart rate was up a little, around 104. She checked back in the chart a ways and it appears Janet is often in the 90’s and low 100’s. I asked Dr. Price about it and he says it’s likely a switch in her brain stem telling the heart to beat faster. As long as it doesn’t sustain at 120 or 130 he’s not worried about it. Because of her high heart rate I let Janet rest a little before starting our stretching routine. Tom came in later on and we put Janet on her tummy. She tolerated it very well with little change to her heart rate and lots of good movement from her. She even helped me roll her over after 45 minutes. After a short rest I sat her up for some standing then Christi and I weighed her. She gained almost a kilo from last week. Good news! We did some more work on talking and signing etc. No luck on the talking yet and Janet refused to do the sign language thing today but she repeatedly closed her hand to a fist then lifted her pointer finger as instructed. She seems fascinated by her hand and fingers so maybe that’s the way to go for yes and no. Heidi came in to read with Janet and I took off to deal with LTC financial issues. Thanks to Laurel I’m going to Nanaimo tomorrow to see my parents. Praying for immediate and full healing and the ability to talk. Thanks but I’m driving. It’s actually faster. Say hi to Mom and Dad Larry. Give them a squeeze for me! Hello Team. Updates on Facebook Messenger will end Sunday September 2nd. Most of you have been sent an invite to the Team Save Janet blog. If you have not received an invite it’s because I do not have a valid email address for you. Please email me at ldieno@gmail.com for an invite or assistance in following the blog. All future Team Save Janet updates, events, photos etc. will appear on this blog only. By following you will receive email notification each time there is a new post. Feel free to invite anyone you know who is not on the Team but you feel is worthy. I look forward to your continued support. A solid afternoon shift with Mom. I arrived and we spent some time chatting and doing some signing. She still never used “yes” or “no” signs in response to a question, but she did quite methodically figure out how to do the “no” sign and imitate it back for me. She was soon put in her wheelchair and we headed down to the beach. Larry was riding by on his bike and joined us for a bit. We all gave Gaga a call together and it was nice to see Mom focusing on the phone as her mom chatted to her. Larry even caught Mom looking over to me a few times when Gaga directed questions to me. Once back inside, Mom quickly appeared uncomfortable in her chair, lifting up her left leg and moving forward lots. I asked her if she wanted to go back into her bed, and prompted “yes” or “no” signs, but no luck. However, she did start motioning to the bed and leaning over to try to touch it, increasing this action over time as we waited for the nurses to come to move her back to bed. It was very clear she was trying to communicate she wanted back in bed. She also leant over to put her magazine and glasses on the bed, and threw them at the bed when she realized couldn’t quite reach that far. Both objects hit the bed – who knew Mom was the one we all got our basketball strokes from??? Once in bed, she still appeared uncomfortable or distressed about something, and nurse Arlene decided to give her some Tylenol. She settled down enough for a little snooze while I was reading to her, but then woke quickly and began Houdieno. I attempted to play a game of Tic Tac Toe with her. Although I wouldn’t say she actually made a move, she did attempt to make a scribble (which happened to be on the board). She also successfully took 2 pillowcases off of her pillows. It seems clear her bed cleaning skills have been spared! I moved her onto her back and stretched her out and this seemed to relax her, enough to put her to sleep. I then left her for the night looking quite peaceful tucked in bed. We began the day with some chatting and some sign language. Mom didn’t seem very cooperative with signing, so I ditched that and began her morning stretch. She was somewhat tight but loosened up relatively well. This also put her to sleep, and she had a solid 30-45 minute morning nap. After that, I got out the mirror and played around a little with that. Mom really stared intently at her reflection, and moved her hair around a little while looking at herself. I tried to get her to copy my mouth movements (e.g., “open your mouth on 1, 2, 3…”), but didn’t have any luck. However, she did slightly open her mouth once or twice when I touched it on the third count. We did some reading to allow her to relax, and then I tried signing again. A great surprise: all I said was “Mom, show me yes with your hand” without doing any hand motions myself, and she lifted her hand, did a small wave but then actually did the yes sign!! Either she has learnt that doing that is the only way to shut me up, or she actually put together yes and the hand motion! Pretty excited that it may be the latter! She didn’t repeat it when I asked again later, but you really have to catch Mom at the right time for these new things. Physio was a fill-in for Tom today so she didn’t make it by until 1130 or so. It was Jane, who Mom had for physio several times when in the surgical ward. Jane was tight for time so didn’t do much other than the basic range of motion, but she really did push Mom past her usual stretches with Tom. A few painful/worried expressions from Mom, but it generally seemed like a good sign that she was being pushed further than usual. Jane noted that it really is not Mom’s left hip that is limited in range, but her knee, which was clear when she dropped Mom’s leg over the bed. Mom relaxed after Jane left, and I read her some Anne until she fell asleep. A well-deserved nap. She will soon be treated to a visit from Kiko, and then I’ll return later in the afternoon. Jack joined me (Heidi)Yesterday during our reading time with Janet and it turned into an exciting event for us. I have never see her so beautiful and alert. From all those outdoor beach strolls with Larry, she has acquired a gorgeous tan.